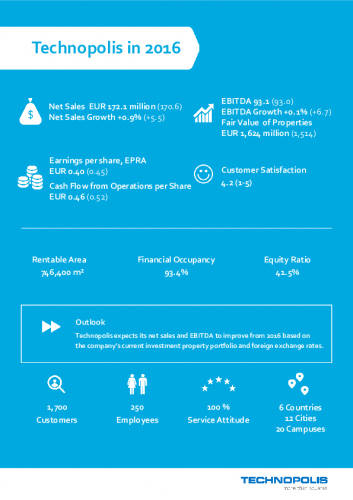 Technopolis delivers a solid financial performance for 2016 with modest top line growth of 0.9%, EBITDA growth of 0.1% and healthy occupancy at 93.4%. There was a significant increase in service volumes of 10.6%, now 13% of total sales, and EBITDA jumping to EUR 2.1 million in 2016. In the fourth quarter, Technopolis proceeded with the integration of the Gårda campus in Gothenburg and divested its Lappeenranta operations and Finnmedi campus in Tampere. The expansion of Vilnius campus was being completed in December, with pre-occupancy over 85% and final fit-outs underway. In Helsinki and Tallinn, construction of new projects is proceeding as planned. Due to the rights issue and divestitures, Technopolis’ financial liquidity is strong. According to its growth strategy, the company will continue to focus on finding new value-creating investment opportunities and divesting non-core assets in Finland. The year 2016 showed that shared economy has arrived in the real estate business. “We have seen an ongoing trend toward less square meters per person as customers pursue higher density. They are ready to pay a premium for flexibility, they are ready to share services and infrastructure and, increasingly, they want to pay only for what they use. The rise of service volumes is a sign of this ongoing change,” says Keith Silverang, CEO of Technopolis. “The shared economy has now clearly found the real estate sector and the winners will be of the players that provide the flexibility and efficiency that customers are demanding. Technopolis will continue to develop its concept, services and campus network to meet customer needs as the forces behind the shared economy intensify. That means reshaping our campus portfolio through strategic acquisitions and divestitures, increasing the relative share or coworking solutions in our mix and boosting service sales and earnings,” says Silverang. UMA Workspace is Technopolis’ network of coworking spaces. The flagship of the chain, UMA Esplanadi, opened in downtown Helsinki in May 2016. Technopolis’ financial statements release is available here. The webcast briefing in English for investors, analysts and media will be held today at 10:00 a.m. Finnish time. The link to the webcast is www.technopolis.fi/webcast. Technopolis provides the best addresses for success in six countries in the Nordic-Baltic region. The company develops, owns and operates a chain of 20 smart business parks that combine services with flexible and modern office space. The company’s core value is to continuously exceed customer expectations by providing outstanding solutions to 1,700 companies and their 50,000 employees in Finland, Sweden, Norway, Estonia, Russia and Lithuania. The Technopolis Plc share (TPS1V) is listed on Nasdaq Helsinki.